1. Thin the bush about a month before the last predicted frost to remove dead, old, or weak canes or canes that cross through the center (shown in red) to give the plant an open, vaselike shape. When should you prune? Repeat-blooming roses are usually pruned just before dormancy ends in late winter or early spring. Roses that bloom only once a season are traditionally pruned just after the bloom period ends; strong new growth produced after bloom will bear flowers the following spring. The amount of pruning you’ll do depends on the rose. Most old garden and modern shrub roses need little pruning; you’ll prune simply to remove dead or damaged limbs or to lightly control growth. After you have removed all unwanted growth, reduce the length of the remaining stems. In mild-winter regions, cut them back by about one-third to one-half. 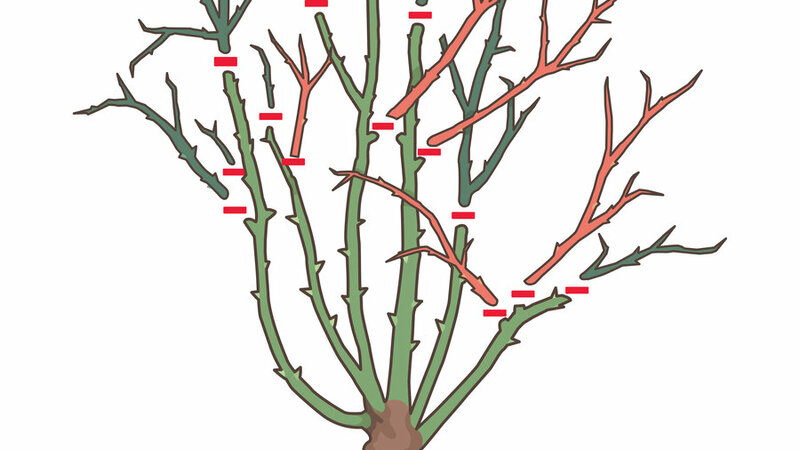 In cold-winter regions, cut out dead and damaged stems after you remove protection; the final size of the bush depends on the severity of the past winter.